SAN JOSE, Calif. (AP) -With several key Sharks players resting up for the playoffs, the Phoenix Coyotes had a chance to keep their faint postseason hopes alive. 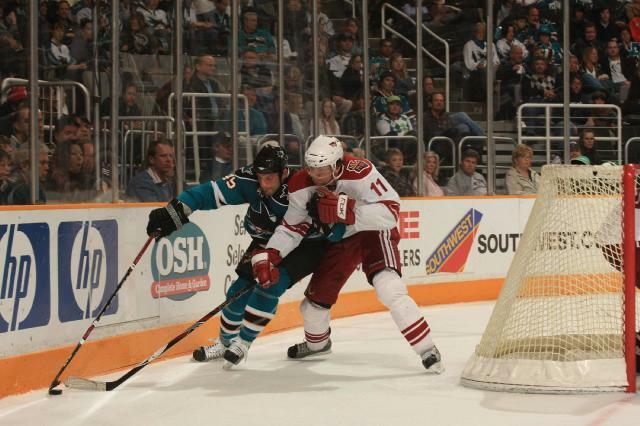 Unfortunately for the Coyotes, Joe Thornton wasn't one of those Sharks sitting out. Thornton scored two goals in the first period, and streaking San Jose eliminated the Coyotes from playoff contention with a 3-1 victory Sunday night. "When you're scoring like that, you just want to shoot everything you get a chance to," Thornton said. "Right now, it's just finding the back of the net. Just keep shooting, and you never know." Thornton has never scored more than 37 goals in his decade-long career as one of hockey's top passers, but his 28 goals this year are his highest tally in a half-decade. "When you have a centerman that size who's that good and works that hard, you are tough to beat," said Phoenix coach Wayne Gretzky, who knows a few things about high-scoring centers. Curtis Brown also scored and Evgeni Nabokov made 19 saves for the Sharks, who have earned a point in every game since Feb. 20 while rolling to the third Pacific Division title in franchise history. They have 36 points in their last 19 games, including three straight wins since an overtime loss at Phoenix on Tuesday. Already assured of a top-two playoff seed, the Sharks' 17th victory in 19 games keeps them barely in the race for the top spot behind league-leading Detroit, which has a five-point lead with three games left for both clubs. With 106 points and three games to play, the Sharks easily could surpass the franchise record of 107 points set last year. Three more wins would tie the club record of 51, also set last season. "The guys were doing all the little detail things," Sharks coach Ron Wilson said. "I thought we totally controlled the game. They were still alive in the playoff race. They had something to play for. We didn't let them. Especially when you score in the first shift, we let them know early that we wanted to win the game." Captain Shane Doan scored his 28th goal and Ilya Bryzgalov stopped 29 shots for the Coyotes, who'll miss the playoffs for the fifth straight season, though they need just two more points to earn their best record since 2002. Eighth-place Nashville earned one point in an overtime loss to Detroit to move seven points ahead of the Coyotes, who have just three games left. 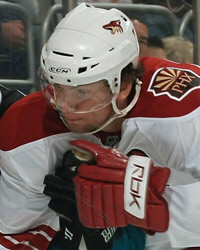 "We had a chance this year, and we dropped the ball completely this time," Doan said. "It's frustrating. As a player who hasn't been in the playoffs for a while, I want to go back. We had opportunities to make the playoffs, and we couldn't." After the Coyotes' seventh loss in eight games, Gretzky was a bit more conciliatory in what's shaping up as the most successful season of his mostly unsuccessful coaching career. "We've had a nice turnaround this season with our young players," Gretzky said. "A week ago, we were right in the thick of things to make the playoff race. Nobody really anticipated that or expected it. ... This has been a tough three or four games for us because they battled so hard all year, (and) all of sudden you're out of it. That's made it tough. I talked to them today, and I told them that you have to have pride in yourself and show up and play hard." Forward Ryane Clowe had an assist on Thornton's opening goal in his return to the Sharks' lineup for the first time since incurring a knee injury that required surgery in October. He missed 67 games, but hopes to be at full strength for the postseason. Notes: The Sharks gave the night off to F Jonathan Cheechoo, D Craig Rivet and rookie F Devin Setoguchi to heal minor injuries. F Mike Grier also got the night off to rest, though he's healthy. 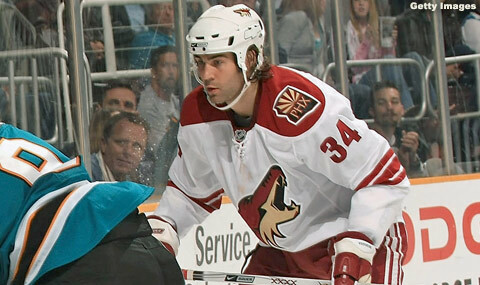 ... Phoenix needs just two points in its final two games to finish with its best record since the 2001-02 season. ... Nabokov finished strong in his NHL-leading 45th victory. He has four more wins than second-place Martin Brodeur of New Jersey, which has four games left.